Education is of paramount importance for the growth of any nation, and must be imparted equally to all. However, India's literacy map presents a patchwork of different images for different states; one of the darkest among these is Madhya Pradesh, which is home to 6.1% (15.42 lakh) of the 2.51 crore illiterate children between the ages of 7 and 11 in India. The matter is further complicated when you add the plight of the Scheduled Tribe (ST) population into the mix. "The Scheduled Tribe (ST) population of the state of Madhya Pradesh is 21.1% of the state population (15.31 million out of 72.62 million) as per the 2011 census. The literacy rate among the tribes of Madhya Pradesh is lower if compared with that of all STs at the national level (47.1 per cent). Male and female literacy rates among the tribes (53.5 per cent & 28.4 per cent) are also lower in comparison to those at the national level (59.2 per cent & 34.8 per cent)." I love to read and write. One day I will make my parents proud. These figures are shocking indeed and point towards the severe disadvantage faced by ST children in the state. Fortunately, there are glimmers of hope as I found in my research for a UNICEF report (for which I was provided materials by Anil Gulati, Communication Specialist, UNICEF). The Madhya Pradesh Vigyan Sabha started a schooling project for the children of the Bharia tribe in 2014. There's an old adage which says, "Don't teach students what to think, instead teach them how to think"-- and this is what the project aims at. The main focus of the project is to provide an education to these Adivasi kids and encourage independent thinking in them. This is in line with Article 14 of UN Convention on the Rights of The Child, which articulates that every child must be allowed freedom of thought and belief. The children are already reaping benefits not only in their education but in terms of their self-esteem. For example, Manglu Bharti, a 14-year old student says, "We have a library in our school. We can register our names and borrow story and poetry books. This is a very good concept for us." Another example of multi-faceted learning is the innovative and creative wall artwork termed as 'Guiyan' by the students of Patalkot, Gaildubba, in a school managed by the Tribal Welfare Board. From cleanliness to water conservation to maternal welfare, these kids have covered a wide range of socially relevant subjects which reflect in their artwork. Their work is inspiring and thought-provoking, and a clear sign of how effectively their perspective has been broadened by their education on a diverse number of subjects. "I don't like dirty, littered places. 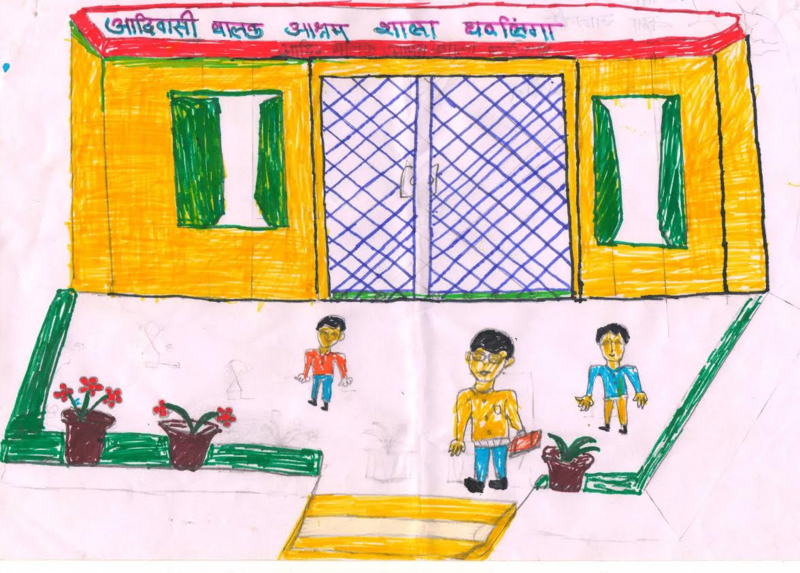 I like greenery all around," says Ajay, a class 8 students from Gaildubba through his artwork. In our village girls get married at a very young age and they are not allowed to pursue any career. This is very disappointing. "The toilets are close to the school and they are not dirty as they are cleaned twice-thrice a month. Also there is enough water," says class 10 student Neetu Bharti from Gaildubba. Devika Pachlia, a class 10 student from Gudichhatri says, "I love to read and write. One day I will make my parents proud." It is not all a fairy tale, of course. Neetu of Gudichhatri speaks of travelling 10km on foot to school and then trudging back the same distance. Some of the students are miles from the nearest drinkable water which has to be hauled in large containers by hand. Heera Bharti, a class 12 student from Dhanakaudia expresses how a lack of concrete roads in her village affects day to day life -- food supplies get stalled, children have to walk long distances and pregnant women have to endure an unsafe journey to the hospital. Savita Bharti, a class 9 student of Dhanakaudia complains, "In our village electricity doesn't come on time and despite of that we get huge electricity bills to pay which is unfair. With no electricity, we are unable to study." While proper electricity remains a dream, the darkness of ignorance is lifting from this generation of children, who are sensitive to the need to counter socially regressive practices. "In our village girls get married at a very young age and they are not allowed to pursue any career. This is very disappointing. Both boys and girls should go to school and not skip it," said Holika Rotiya, a high school student from Ghatling. With encouragement to think for themselves and express themselves freely, these children are flowering thanks to their education. "It is important that children are raising issues which matter to them and it is their right to do so. The state government must then ensure they are heard, protected and nurtured," says Trevor Clark, UNICEF. The positive outlook of these children has stemmed from the education being provided to them. While the government must open more schools and ensure that children have access to quality education. It's a cliché' now, but it's still true: It does take everyone (i.e. a caring community) to provide what these tribal children need. That means not only families, not only school staff, not only police, not only government--but all of us working together for a common purpose: to make sure that children have what they need to learn, grow and thrive in safety.